Founded in 1986, Bright Horizons Family Solutions is a leading provider of employer-sponsored child care, early education, and work/life solutions. Conducting business in North America, Europe, and India, the privately held company has created employer-sponsored child care and early education programs for more than 850 clients, including more than 130 of the Fortune 500. Bright Horizons has consistently been the only child care organization named to the “100 Best Companies to Work for in America” list by FORTUNE magazine. Tell us about the company’s background and founding. Tocio: Bright Horizons was founded by Roger Brown and Linda Mason, husband and wife, in 1986. They were very young, 29 and 30, when they started the company. It always amazes me how incredibly bright they were about thinking about culture at such a young age. They functioned very much as a team. We had this very elaborate succession planning process that we had put in place a couple years before. Roger was going to be stepping down. In 2000, I became President. In 2001, Roger stepped down and Dave Lissy, who had been our Chief Development Officer, took on the role of CEO. Dave and I have functioned very much in a partnership since then. Dave and I decided we were not going to try to be like Roger and Linda. They were so beloved, and the company had done a fabulous job. He and I were their greatest supporters. We needed to carry on the parts of the company culture that we both believed were really important, but to do it in our own way. For us, it was really important in the very beginning that we were in the field meeting the people, listening to the people who are actually delivering the service. How would you describe the organization’s leadership approach? Tocio: It’s very collaborative. That’s always been a big part of our culture. This is a for-profit business that basically hires teachers who many have come from the non-profit world. So you’re dealing with non-financial managers who really are in it to make a difference in the lives of children and families. People are not in it for the money. So it needs to be collaborative. You have to get buy in. The leadership that is most successful in this company is a persuasive style of really taking the time to explain to people what the goals are, and the strategy for getting there, and get their buy-in and persuade them that you’re doing it for the right reasons. How do you personally approach leadership in the organization? Tocio: I’m basically a control freak by nature. My kids would tell you that. I definitely learned over time that I need to look at what are the things I’m really good at and be able to hire good people and let them do their job. That was a learning experience for me. We now have 22,000 employees and about 750 centers in 44 states and six countries. I certainly can’t be the person to make every decision. To me, it’s hiring great people who are hopefully smarter than you are and trusting them to do their job. We set goals as a team. Then I focus on holding people accountable. Decisions are made quickly. We really want this company, decades in, to have a very young, entrepreneurial feel. You won’t be responsive if you don’t get people to make decisions quickly. Tocio: We have high principles, which anybody in this company can tell you about. You can go into any staff lounge and you’ll see them. They are honesty, excellence, accountability, respect, trust. This is a very respectful environment. That doesn’t mean that everyone agrees with everybody, but people are always kind, respectful, and caring. This company has very high ethical standards. Our culture is built on passion for what we do. We believe that we are really in this business to make a difference in the lives of children and families. We’re also smart about the fact that it is a for-profit business. In order for us to be able to do that, we have to make a profit. Profit is our oxygen line. We always remember that. But we’re here to make a difference in the lives of children and families. The culture is flexible. It’s entrepreneurial. We want to feel young. We want to be innovative. Its quality-oriented. We’re very customer-service-oriented. We bend over backwards for our parents, for our clients. And there’s truly a focus on employees, because for us real quality comes down to the teacher. You don’t buy childcare because of Bright Horizons. What you look at as a parent is: who’s taking care of my child? If we’re not focused on employees, we know we won’t be successful. We have this mantra: if you’re not caring for children you need to be caring for somebody who is. When you talk about making the lives in the difference of children and families and profit being the oxygen for that, are there examples where those two may have come into conflict? Tocio: There are many examples. Early on, it was cribs. This was when we were a really small organization. I was just at the company and I remember saying, well, there’s just no question. We have to get rid of all these cribs. It’s going to cost us a lot of money, but we would do that. You always think of the child. For us, safety of the child is always paramount. I have grandchildren who use our centers. If I don’t feel comfortable having my own grandchild in the center with this teacher, then I don’t feel comfortable for any child. How was the culture built, and by whom? Was there a role for the board, the leadership team, HR department? Tocio: Our culture is thoughtful and planned. It doesn’t just happen. It’s hard to describe the culture of this company without going back to the founders, Roger and Linda. I had much more experience than they did when I joined the company. They were younger. They hadn’t really managed companies. They had done work and had been in consulting practices. I had managed a large multi-site healthcare organization, but I really learned from them the importance of culture. For Dave and me, it’s really maintaining the culture but also improving it. We’re always careful about not hurting the culture. It’s the culture that fuels the passion here. HR plays a big part of it. We measure everything. We have parent satisfaction surveys and client surveys. We ask our people in the field how our home office and our regional office are supporting them. And we read and act on those surveys. In this business, it’s the little things that count. 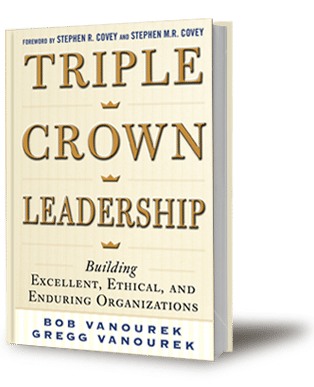 What are the most important things that leaders can do to create the conditions for high performance with integrity in organizations? Tocio: It’s modeling. You have to have integrity in this business. You’re caring for people’s kids, so if you are not an honest, ethical person who makes sound honest, ethical business decisions, then you don’t have a place in this company or caring for children. What personal characteristics are necessary for leadership there? Tocio: Emotional intelligence is critical. And character. I can’t think of anyone on the executive team that I don’t have the utmost respect for. There is somebody who would like to be on our executive team and I’m not supporting it, because I don’t think that person has the character that reflects what we’re all about, and I’m vocal about it. What does it feel like to work at Bright Horizons, with that culture and leadership dynamic? Tocio: In the twenty years I was in health care, I never felt like this. I always liked my job, but I love this company. I love the people I work with and the work we’re doing. It feels great. It feels especially good because now I’m also a customer for the first time, because I have three grandchildren who use our centers. I see the difference. A few years ago, my daughter was a first-time mom and developed breast cancer. She needed to go through chemotherapy, radiation, the whole bit. So I dropped off my infant grandson every morning going to work, picked him up every night, and really was a user of our services. I can tell you, I always felt proud of the work that we did, but when it played out in my own life I said, you know, what if I didn’t have child care to the quality that we do? It made a huge difference in my daughter’s recovery and my own grandson’s stability. So I am the biggest fan in the world. I feel very privileged to have my position.